And no one was holding the ladder! I was in the garden around 6pm today, and I swung round startled. I heard voices so close I thought someone was behind me. The yells came from above though. It then dawned on me that it’s a month to my village’s annual Festa, and the yells were from the parish volunteers putting up the decorations. Not just any old decorations, but the grand illuminations and regalia that adorn the church – from atop the pinnacles of the belfries and dome to its interior which is bedecked with deep, bulls-blood red drapery. Don't say I left the bulbs down below? 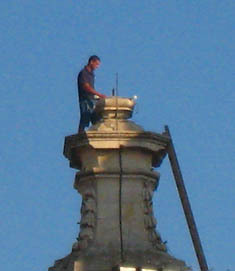 The festa daredevils, steeplejacks or what you will, risk a fate as bad as death each year. I’ve seen what look like rickety wooden ladders and platform contraptions levered out from the dome so someone could manage to get light bulbs working up in the gods. I’ve seen people manage to pass each other on the ledge that runs around the bottom of the dome, when I thought it wide enough only for pigeons to strut on. I’ve seen people lean out, without a harness, to reach a stray electric wire, a defunct bulb, or something that blew out of place in strong winds. The dome often ‘sings’ with whistling wind around it. No one has yet in my living memory fallen off. It’s bound to happen. 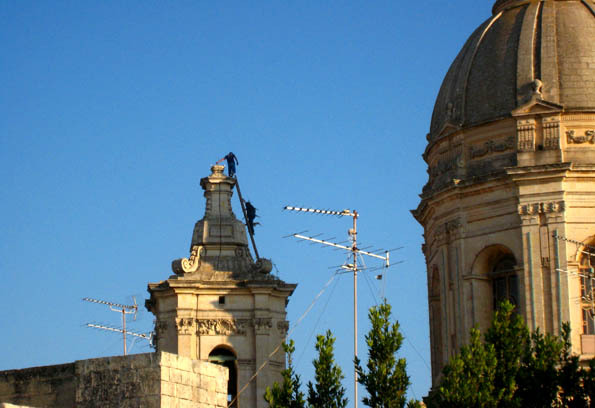 Just like each year the preparation of festa fireworks claims lives in Malta. Health & Safety law enforcement? EU laws? These don’t even come into play when festa preparations are under way. No one cares. Until their son falls to his death one day. Tomorrow, I’ll get the zoom working better and snap them on the top of the dome. Even more unbelievable a sight. To translate the above comment: “If you’re not there (on the spot) you cannot speak, as that guy would be tied from the ground”. We have seen this played out over many years and never seen ropes – perhaps Liz’s camera missed a rope at that point, but the guys who walk around the tower, on the plinth pediment bit, DONT have anything tying them on for sure as they simply walk around not unhitch ropes! People blow themselves up all in the name of festas and fireworks are let off in squares – all appalling safety! This is another accident waiting to happen.